The undersigned representatives of the Nuba Mountains civil society organizations across the globe, our Sudanese partners, and peace loving friends worldwide, write on this 4th anniversary of the second genocide in Nuba Mountains/South Kordofan of Sudan to share the grievance of the Nuba peoples. Collectively, these crimes have resulted in the displacement of over 5 million people and the deaths of nearly 3 million people, the largest state-sponsored ethnic cleansing and genocide since WWII. The NCP deliberately prevents food, water, medical and school supplies from reaching civilians. They use denial of food as a weapon against civilians in all the war-affected areas of Sudan, especially in the 85% of Nuba Mountain land controlled by SPLA freedom fighters. Reconsider and reform the policy of pressuring victims of Sudan’s aggression to make deals with that oppressive dictatorship. 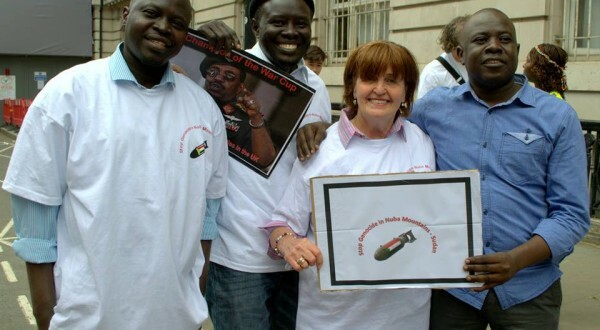 Negotiations with the NCP should be in the USA and include Nuba civil society groups. Decades of “peace negotiations” with Khartoum have led only to weak resolutions descending repeatedly into broken commitments, numerous unresolved issues, and further deadly conflicts. Prevent aerial attacks on civilians either by imposition of a no-fly zone, destruction of the NCP aerial assets, or by other means, such as support to those who fighting to protect civilians and promote freedom and democracy. Retain sanctions against the NCP, as well as the listing of Sudan as a country harboring and supporting terrorism. Any fines for sanction violations should go to people affected by the genocide i.e. Nuba Mountains, Darfur and Blue Nile. Work with the UN Security Council and Department for Peacekeeping to create, monitor and deliver sufficient humanitarian aid to all civilians in need. Permit immediate and unconditional access for international humanitarian aid, including both personnel and supplies to vulnerable and displaced populations. Comply with civil rights norms under the regional and international conventions, particularly those of freedom of assembly, association, press, religion and speech, and those prohibiting and preventing violence against children, women and girls. Recognize Sudan’s cultural diversity and establish institutions to assure separation of religion and State, and to respect the rights of Christians and churches in Sudan. Acknowledge the right to equal citizenship and establish it through a real constitution. Withdraw all NCP forces, militias, and foreign terrorist mercenaries from the region. Come to new political, wealth sharing and security arrangements that meet the expectations of the people of the Nuba Mountains. These procedures should be monitored and observed by the national community under chapter 7 mandate. Release all detainees, war prisoners, and those who have been indiscriminately arrested because of their ethnicity, opinions, religious or political affiliations. Fulfill obligations to the ICC by surrendering to the court those subject to arrest warrants, including Al-Bashir, imposed governor and war criminal Ahmed Haroun, and other suspects. The people of Nuba Mountains across the world call upon you to stand up for the rights of the Nuba Mountains. Together, we publicly condemn the fourth year of the Government of Sudan’s second genocide against its own civilians, the peoples in the Nuba Mountains/South Kordofan. We appreciate your commitment to end the suffering of the Sudanese people and to bring a lasting peace and end to the suffering of the marginalized people of Sudan in particular and all Sudanese in general.